Around the turn of the 16th century, the Unicorn Tapestries* were woven in the Southern Netherlands. These tapestries depict the Hunt of the Unicorn in 7 panels. It has been reproduced in many forms over the years in many different art styles. Several days ago, the 8th Unicorn Tapestry was discovered. This one is believed to have been burned in a fire not long after the artist completed it. No one is sure whether the fire was intentional or accidental. 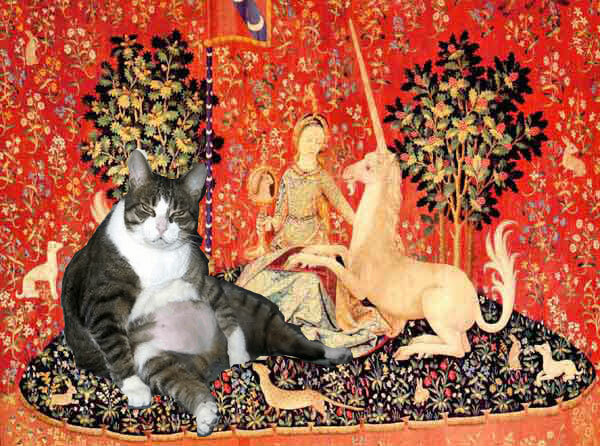 This 8th tapestry has been dubbed “The Fat Cat Tapestry**.” There has been much speculation about the origins of the design, but after much research, the cat is believed to be the beloved pet of Anne of Brittany who commissioned the tapestries as a wedding present to her husband. It is little wonder why the artist would have wished this particular tapestry to remain out of the public. *For more on the Unicorn Tapestries check out the Musée National du Moyen Age in France. **This assignment from DS106 was just too good to pass up. This entry was posted in Uncategorized and tagged ds106, visualassignments, VisualAssignments334 by Nikkapotamus. Bookmark the permalink.